Additionally, the Florida Department of Health in Broward County leads the Tobacco Free Partnership of Broward County. The Partnership is a community coalition of individuals who are committed to making Broward County a safer, healthier place to live, work and play. Partnership members have an interest in developing tobacco-related policies that prevent exposure to secondhand smoke, youth from accessing tobacco products and provide opportunities for individuals to become tobacco-free. Membership is open to the general public and professionals interested in tobacco use prevention. For information, call 954-467-4807. 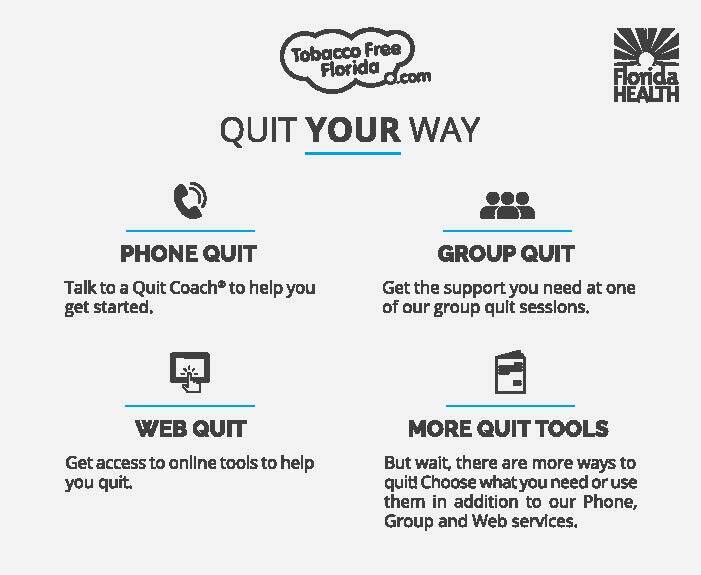 Tobacco Free Florida knows quitting can be very hard, but it's not impossible. In fact, there are more former smokers than current smokers in Florida. With the right help, resources, and the support to keep you going, Tobacco Free Florida can give you the best chance to quit for good. For each person, overcoming nicotine addiction is different and we can help you choose a path to quitting that works for you. In fact, Tobacco Free Florida's quit services can double your chances of quitting any form of tobacco for good. Tobacco Free Florida offers you choices to Quit Your Way. For more information, visit Tobacco Free Florida.